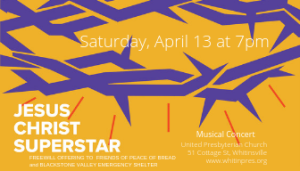 Jesus Christ Superstar is a timeless work set against the backdrop of an extraordinary and universally-known series of events but seen, unusually, through the eyes of Judas Iscariot. Come enjoy the free concert, a freewill offering will support Peace of Bread Community Kitchen. Our church is located on the corner of Cottage and Spring Streets, right behind Unibank in Whitinsville. Street parking is available without restriction, and you are welcome to park in the Unibank parking lot as well.